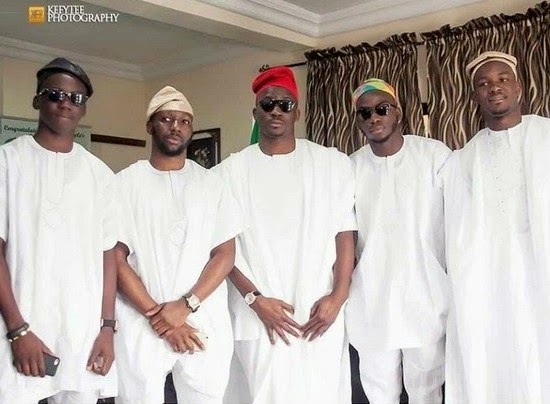 Meet the handsome boys of Ayo Fayose, the Present Governor of Ekiti State. Their names are Boluwatife, Nigba, Femi, JOju, Tomiwa and Rogba. Like father like sons, I hear four of them have very strong character like their father and they are very active on Facebook, Twitter and Instagram. Ekiti is really blessed o..
well they are all so cute, i hope they are all form one woman, i do like d middle one, i mean d number 3, he his really sweet. Precious, na wetin is you need numba three for? Is you nevers marrys bifors? But it is doing me like say I am sabi that one wey is wears blak kap upon the head. But where it be I am dont knows. Very beautiful young men. May the Divine Creator continue to bless Governor Fayose and his family.